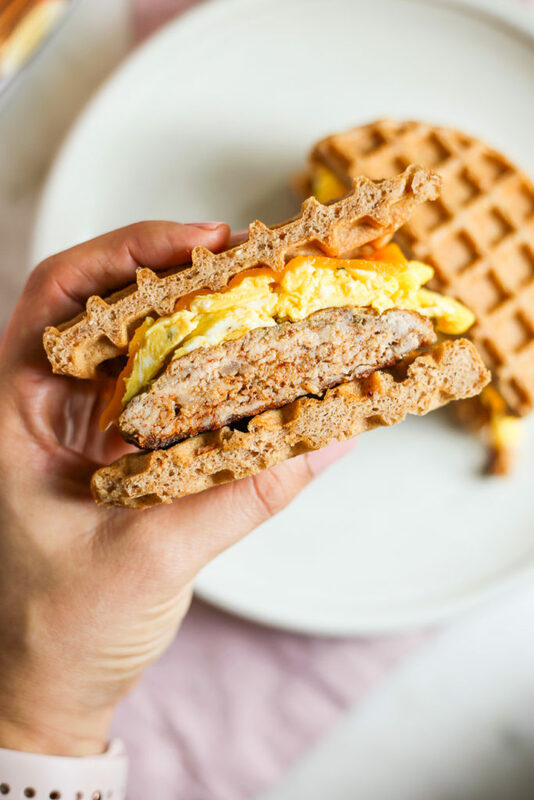 Okay, this breakfast sandwich is NEXT LEVEL. I made this for my family last weekend for a fun Sunday breakfast and we all loved it so much! 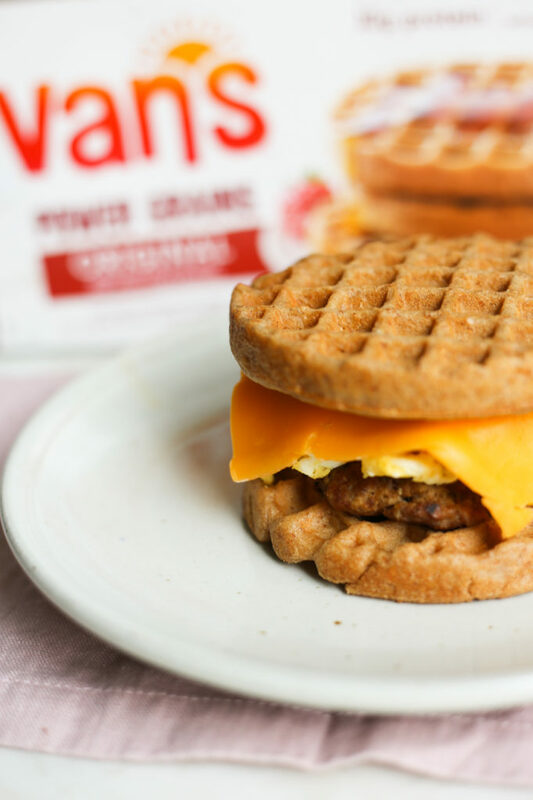 Toasted Van‘s Gluten Free Power Grains Waffles ®, homemade pork sausage patties, scrambled eggs and cheese. I mean…. The best part about this recipe other than the fact that it tastes like breakfast heaven? You can make them ahead at the beginning of the week and heat them up for breakfast all week! I make 2 whole waffles sandwiches, cut them all in half, and wrap each half in foil. In the morning, I preheat the oven to 350, pop them in there until they are heated through, about 10 minutes, unwrap them and have the kids fed, dressed, and out the door to school in no time! yes! If you’ve never had Van’s ® Gluten Free Waffles or Pancakes, you are missing out. My kids, and I, absolutely love them and they are a staple in our freezer! 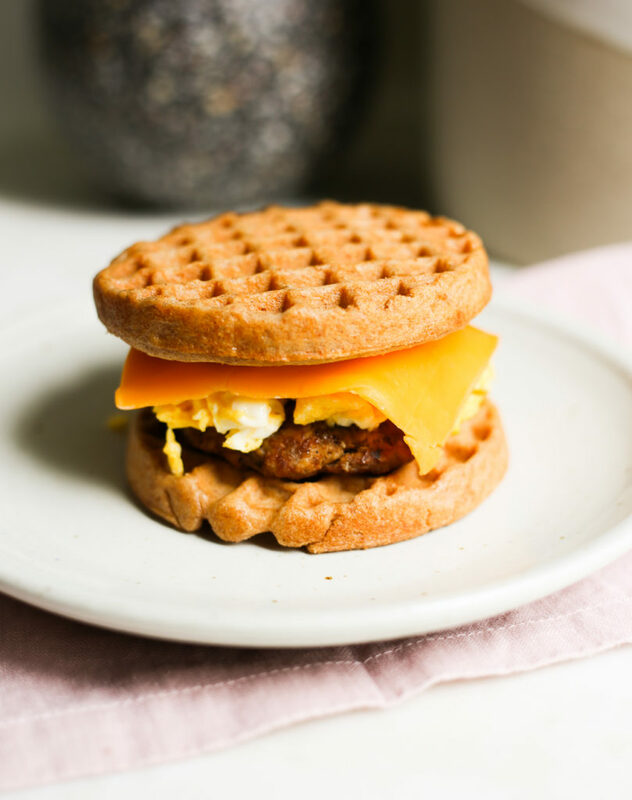 They have an assortment of flavors, all of which are fantastic, but I especially love giving my kiddos the Power Grains ® waffles, as each serving is packed with 10g of protein! 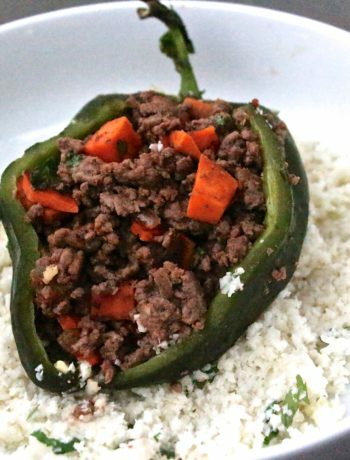 In a bowl, combine the pork, pepper, salt, ground sage, garlic powder, onion powder, fennel seed and sweet paprika. Divide the pork mixture into sixths. Use your hands to form a thin, round patty, a little smaller than the width of the waffle. Heat a skillet over medium-high heat and add avocado oil. Carefully place each patty into the skillet and cook for about 4 minutes on each side. In a bowl, whisk eggs together. I used about 2 eggs per sandwich. Heat a small skillet over medium heat and cook, pushing eggs to the center with a silicone spatula, until just cooked through and scrambled. Toast Van's Gluten Free waffles. Assemble the sandwich with a sausage patty, eggs and cheddar cheese. 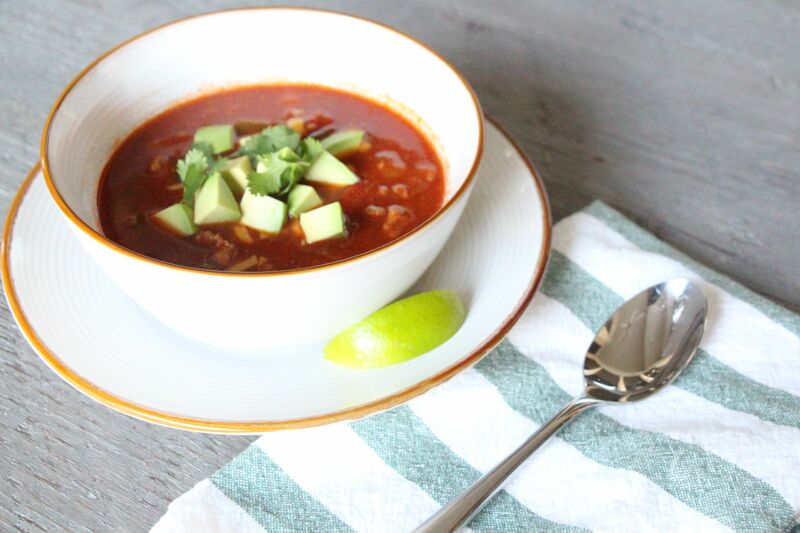 This blog post was in partnership with Van’s Foods. Please note that I only work with companies and products that I feel passionately about and that align with The Defined Dish’s views and that this post contains sponsored content. While I am compensated for the work I do, my opinions are always 100% my own.